Sturdy and classic, the engraved Craft Beer Glass features a narrow rim and fluted top to capture the aromas and flavor of your favorite craft, lager or IPA beers. 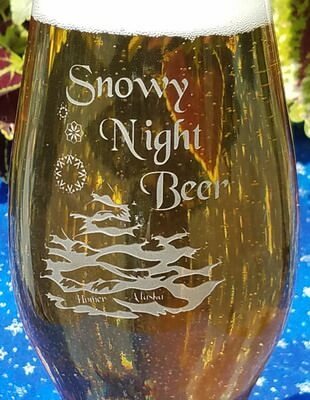 The shape of the personalized beer glass is stylish and easy to hold and a good choice for gifts and logos. This beer glass is 7.75 inches tall and hold 16 ounces. Personalization, text and/or design, on the front of the beer glass is free, other options are available for an additional fee. We suggest keeping your text to 4 lines of 18 characters per line, it is okay to go over, it may just be smaller to fit it on the glass.